Part of my focus on vegetables for this year is going to involve salads and side dishes – things to add to my standard meat and potatoes fare (though in actuality, we rarely eat potatoes). But I’m also looking for main dishes in which vegetables play a starring role. Ideally I’m looking for something which won’t cause my five year old to reject it out of hand. I’ve tried to tell her that nothing mommy makes is yucky, and I don’t ever want her to say yuck, though she may politely express that this is not her favorite dish. Of course, only dessert is her favorite dish, not for any lack of trying on my part. And ham sandwiches. And since I refuse to subsist on a diet of ham sandwiches and ice cream, we are at something of an impasse. Bacon helps. 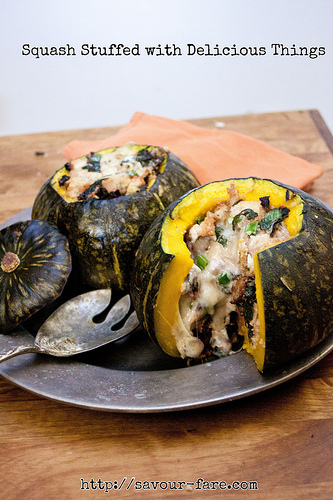 This recipe, which is adapted from Dorie Greenspan, may not pass the five year old test (it is stuffed squash, and she hasn’t TRIED it) but it is one of my favorites. Dorie calls it “Pumpkin Stuffed with Everything Good” and it really is stuffed with, if not everything good, many good things. Things like bread and cheese and (optional) bacon and cream and garlic, and just to up the vegetal quotient, I added red chard, which only added instead of detracted. Since it’s nearly impossible to find an edible pumpkin outside the months of October and November, I make it with Kabocha Squash, which I prefer to pumpkin anyway. This dish also looks better in person than it does in photographs, and tastes better than it looks (I must convince the five year old of this). (As an aside – raw vegetables are BEAUTIFUL to photograph, but the second they’re cooked they look far less appealing. C’est la vie.) You can also omit the bacon the make it vegetarian, but please don’t leave out the cheese. When you’re cleaning the seeds and strings from the kabocha, be sure to use a metal spoon and really scrape out the hanging bits. If you’ve ever carved a jack o lantern, the process will seem familiar. 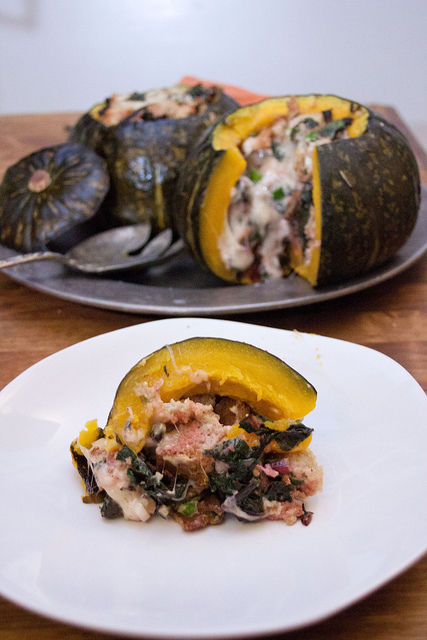 Also really pack the stuffing in — it is, after all, stuffed squash with everything good, and you want to get as much of it as possible. Cut the stem ends off the squash, making a lid (like cutting a jack o lantern.) Using a metal spoon, scrape out the seeds and stringy bits from the inside of the squash and the lid. Wash the chard. Remove the biggest stems from the chard, and cut it into ribbons. Put the chard into a pot with a lid, drizzle some olive oil over it, and turn the heat on low. Cook with the cover on, removing the cover to stir occasionally, until well-wilted, about 5 minutes. Remove the chard and chop finely (you can skip the final chopping, but I have a baby whose culinary enthusiasm far outstrips his dental accomplishments). In a large bowl, toss the bread, cheese, bacon, scallions, garlic and chard. Stuff the mixture into the squash, really packing it in. Pour the cream over the stuffing, (1/4 cup per squash) and let it sink in. Place the squash "lids" on top of the stuffing. Place each stuffed squash onto a baking sheet lined with foil, and bake for 1 hour, or until a knife can easily pierce the skin of the squash. Serve in wedges.